In the last few weeks, spam activities were getting high again and most sites and email account will get a lot of spams message. Remember the Spammed Indonesian Linux Forum? It's one of the case but you will get more than that if you searched over the Internet. For email account, most likely the spammers are using images rather than plain text, so most spam blocker will bypass the attachments. Some of the spam message also came in forms of plain text and it will be bypassed by the spamassasin for example. Blog site which uses WP also suffer from this problem. Even though many of the author has gave a lot of preventive actions such as installing Spam Karma or using some kind of filter to reduce the spams, the spammer is evolving all the time and it's just a matter of time before they can bypass the filter. DetikInet has also wrote an article about the abnormal behaviour about Spam in the last two months. I got this information from a posting in Indonesian Linux Forum which was posted in OOT (Out Of Topic) category and it's really really out of topic. I wonder what will Microsoft said about this site. The new award-winning browser from Microsoft is now faster, securer and quicker anything else on the market. Why use anything else? Choose from three excellent browsing styles! Minimized, Maximized and Fullscreen! SourceForge is holding a SysAdmin of the Year contest and you can promote your own sysadmin (or yourself if you are a sysadmin). They will stop receiving any inputs at 11:59 PM PST on October 31, 2006. The prices are Apple MacBook, Trip to LISA (conference) in Washington DC, Professional License to Splunk, and cases of BAWLS Soda. For those who would like to use SVN but having trouble to find a simple tutorial, please have a look at Bambang Purnomosidi's blog site where he wrote a simple tutorial for day-to-day operation with SVN. He's a lecture in STMIK AKAKOM Jogja and he's very interested in GNU/Linux and UNIX. He also uses FreeBSD in his laptop and used it for his daily work. I met him when we both became the speakers in an Install Fest event in STMIK AKAKOM which was held last year along with Iwan Setiawan, one of Jogja Linux User Group member. Today i looked at Mandriva's Translation page and some items are highlighted in green color, which means that they're updated in the last two days, but when i tried to get the latest version, it failed to create a lock, so i guess it has been migrated to SVN and it is true. Mandriva once again migrate some of the translation project into SVN and this time, three packages were moved to SVN, which is drakfax, drakfirstboot, and rfbdrake. I have updated the SubVersionBasis Wiki which gives you a detailed information on how to checkout, update, and commit through SVN. Update (28 Oct 2006) : It seems that Mandriva has moved more than three packages to the SVN. I just checked it today and i found four more packages, which are drakvirt, drakoo, grpmi, and drakbt. I have updated the SubVersionBasis Wiki also to reflect the latest changes. Just now, i got an email from abuse@openoffice.org saying that my account will be suspended for security reason if i am not clicking a links (http://www.openoffice.org/confirm.php?account=willysr@openoffice.org) to verify that it's my official email. Strange, since my account at openoffice.org is only an alias which will link to my primary email at gmail and i never used that account to send any email address, just to receive some notification from some of OpenOffice.org's services. So, i look at the link property and it links to http://www.nbmd.cn/Confirmation_Sheet.pif, which i can guess it's some kind of social engineering method to attract people to click on it. I guess it's a link which can cause damage to your computer, so please beware before opening such kind of email. One more note, OpenOffice.org never uses PHP for their services. That's what on my mind at the first time i saw this email. Funny. After having some image problems with Bloggers, finally i decided to use other image hosting services and i came up with Photobucket. There're several image hosting services out there and most of them are free, so let's try out this first. Let's just hope it works and my images will be displayed correctly at Planet Terasi, Informatix, and any other aggregator which aggregate my blog. It will make me more busy as i have to logged in into two different sites, but that's OK. I'd prefer this solution rather than having my post displayed without any images at all and some readers will think i forgot to upload the images, even though it is there. Mozilla team has published Firefox 2.0 in some mirrors and Majorgeeks have listed them and you can get the final version of the next Firefox release at http://releases.mozilla.org/pub/mozilla.org/firefox/releases/2.0/. It's hosted at OSUOSL (Oregon State University Open Source Labs), the same mirror that hosted Slackware and become one of two primary mirror for Slackware development. 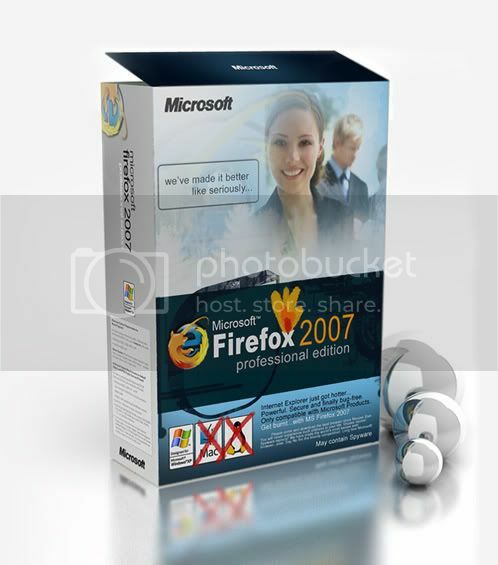 Are You Ready For Firefox 2.0? Firefox 2.0, the next major upgrade is being planned to be rolled out on 24th of October, which will be 25th of October in Indonesian Time. Well, it's a week behind IE7 which already being rolled out last week and i had made a quick review on it, but the most important thing is not about time, but quality. If you are a week behind but you can deliver which is something better, i don't think people will complaint. They just have to wait a little bit longer and that's all. If you would like to see some comparative review, please have a look at PCWorld's review. It's quite detailed and review most part of the both application. For now, i'm still very positive with Firefox's success even though it's kindda behind. Firefox will still be my primary browsers, followed by Opera. I don't know whether it's true or not, but sometimes, my post is not displaying the images on some sites which aggregate my blog (Planet Terasi and Informatix). When i tried to access the images directly, it works, but why does it didn't showed up when being aggregated by aggregators? Is it because blogger have a special function to grab the images (which will make the thumbnail-version of your images if they're too big to be displayed on the screen)? Could be.. So i guess i will have to directly point to the images on the blogger's hosting rather than using the function call provided by Bloggers in order to get the images displayed on other site. I'm not a reviewer and this is my first review on computer things, so please don't mind to send your critics, comments, and suggestion about this to my email. Ok, here we go. Last night, after making an article on my Slackware, i boot up my Windows and i was so curious about the new IE7 and i decided to upgrade to IE7 which i downloaded yesterday. I know this is a major upgrade, but i was so so curious, so i decided to make a new restore point first (just in case IE7 installation messed up my system) and start the IE7 installation. The installation screen was quite nice and definitely nicer than IE6 installation screen (i had tried to install IE6 on Windows 2000 few years ago). 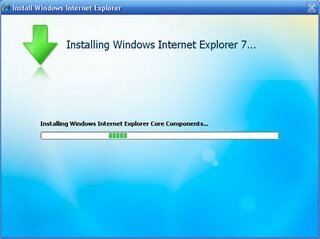 IE7 installation will check whether your Windows version is genuine or not at the beginning, so it might not worked on some pirated edition. After passing the license, it will start installing the required updates component, continued with core components, etc and finally a restart (as usuall). After a restart, IE starts to update the start menu as usuall and personalizing some stuffs and when you have reached your desktop, you will have a new shinny IE logo on your menu (i had one on my quick launch also). Microsoft said that we could uninstall IE7 and came back to IE6, so i checked at Control Panel about this and kindda suprised when i looked at IE7's size. Only 3,34 MB? Unbelieveable. Well, i don't trust this numbers because i know it should be more than this. 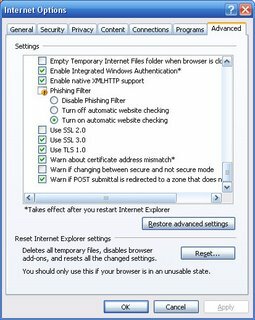 Launching IE7 for the first time may cause some problems, because IE will try to look for problematic add-on and if it found one or more, it will prompt you a warning dialog. I had to disabled one of my add-on, but that's ok, as i rarely used IE also in my daily work. I prefer to use Firefox as my primary browser. Next, i tried to open my website (offline) and it looks good so far. I tried several other offline pages, since i'm not connected to the Internet while testing it, because i'm not in the office anymore and it looks good. 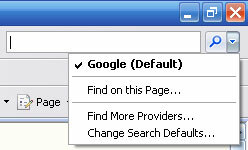 Surprisingly, i looked at IE7's default search engine and it displayed Google as the default. In Beta/RC version, i saw that it listed MSN as the default, but in the final version, they changed it into Google. Next, i'm quite confused about the menubar's position. It's not there anymore. I think it's gone until i pressed alt and it showed up. You do get larger area by hiding the menubar, but as the trade offs, you can't directly access the menubar, although you can use some icons on the right side to access some settings for IE. 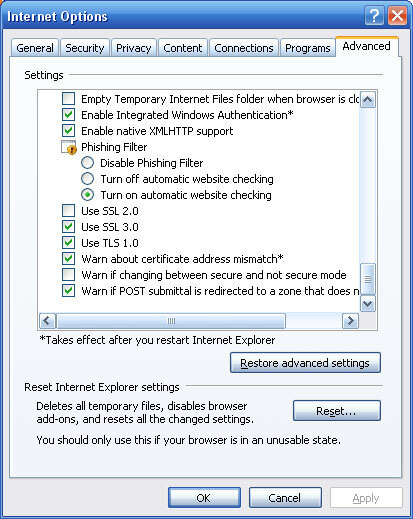 Looking at IE's setting, they surely work very hard to update the interface. Not a big change, but with a new look, i think it's worthed. If you look at the General tab, you can see new setting, which is called Browsing History. 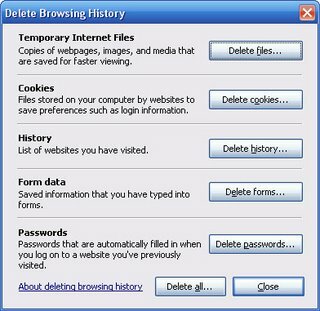 There you can delete your browsing history as well as your private data while surfing the Internet. 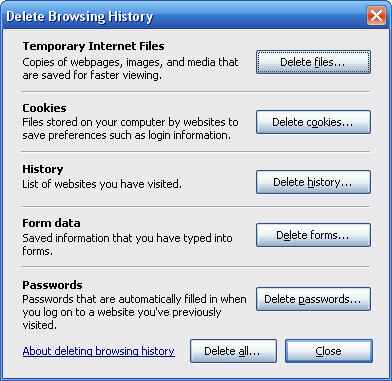 At IE6, will have to delete one by one, but now you can delete all of them in just a single click. 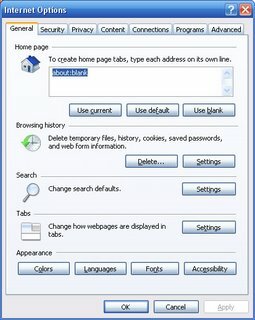 Firefox does have this features long before IE adopts it. 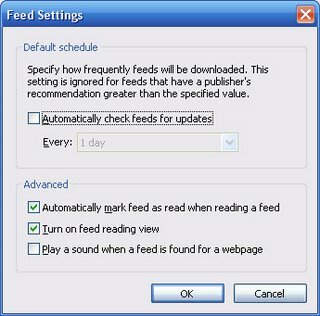 Another new setting is the feed settings. As you probably have known, IE7 have a built in RSS feed support just like Firefox which (again) already implement this for some time before IE did it in this version. When i tried to look at one of my site which has a RSS feed, the result was very nice. I looked at local Indonesian OOo's documentation project site RSS feed (i browse the site offline, but the URL for the site is at http://project.informatix.or.id) and the result can be seen below. If you have Firefox, you can compare the result. The default RSS Schema built in on IE is nice and it can produce a nice interface. The new phising filter option can be set in Advanced tab on the Internet Options or using the icon on the main window. You can see that IE also support XMLHTTP (you may called it AJAX) now which is turned on by default. Some action which can compromised the security setting is turned off by default which is good idea. 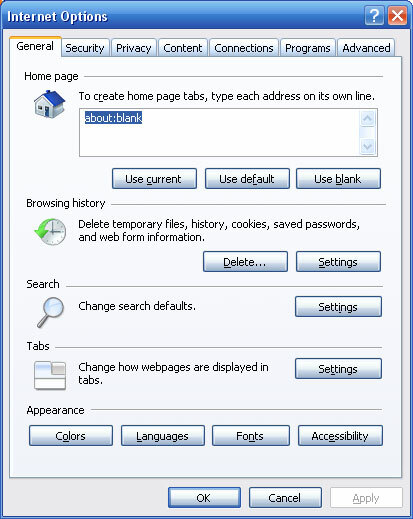 Another new feature in IE7 is the new quicktab (which is like ShowCase extension on Firefox). This feature can be activated if you have opened more than one tab (another new feature in IE7 which already being implemented by Opera and Firefox long long ago) and by pressing CTRL + Q.
I think my quick review is over for now and you will see more public review on some sites. Just watch for more reviews. IE7 has been released by Microsoft. It has a lot of bug fixes, but the next question is do you dare to upgrade? I suggest that you should look at the Release Note first before upgrading. You can get the files from Microsoft Download or from MajorGeeks. For my own laptop/PC, i don't want to rush in by installing this update, as it's one of the biggest upgrade on Windows and IE is one of the vital component on Windows platform, so if something bad happened, you will have unstable system, so i would wait for public review first before i decided to upgrade to the latest IE. For now, i'm quite satisfied with Firefox which will release 2.0 version in a short time (the latest version now is 2.0 RC3). The annually event is back again, Mandriva Linux 2007 Install Fest (it's called Install Party now). The install party will take place on October 21st, 2006 and it's worldwide scope. 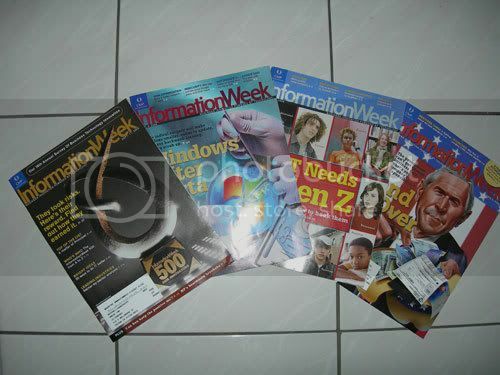 In 2006, Indonesia have hold this event also which can be seen in Indonesian's Mandriva Install Fest. Anybody wants to be a volunteer to be the coordinator for this event in Indonesia this year? You may join mdk-id@yahoogroups.com if you like to join or participate on this event. 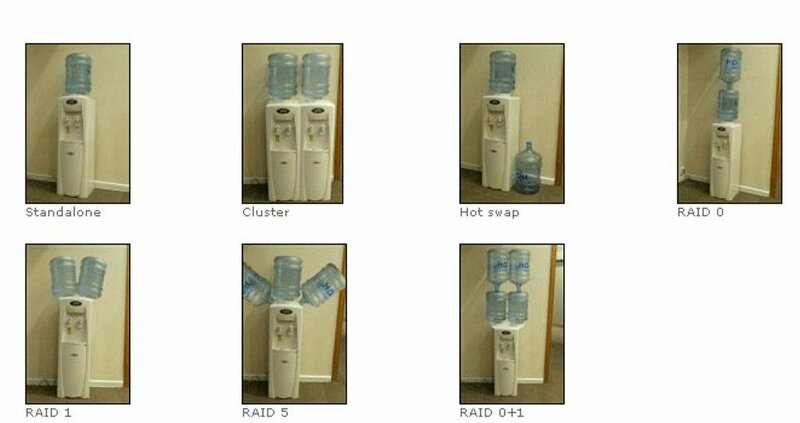 If you want to learn RAID and don't know where to start, just look at the images below from this blog. It shows you a cool ways to learn RAID using funny graphics but it does work. Update: I have to update this post as it makes Planet Terasi screwed up. Sorry folks. RFID is now booming and lots of application started to use RFID. After two and half year of development at the University College London, a new technology to tag passengers in the airport will be trialled in Debrecen Airport in Hungary. People will be told to wear radio tags round their necks when they get to the airport. The tag would notify a computer system of their identity and whereabouts. The system would then track their activities in the airport using a network of high definition cameras. If this project is successfull, then it can be deployed in other places as well in the next two years. You can read the full news at BBC and the register. That was slightly more painful than really necessary.. It's not as big as the first RC (well, the first RC is always a big one because it allows you put most of new things there and next RC is trying to stabilizing the kernel after new changes has been stopped) but it's always worthed to see the changelog (too bad, KernelNewbies hasn't been updated to reflect the latest changes on kernel 2.6.19. They give more human readable information rather than reading directly to the long-format changelog). You can see some new information about RC2 in LWN. It has more detailed information about big interrupt handler prototype change and also initial merge of the developmental ext4 filesystem with a few enhancements. For most people, last minute changes are very very annonying and it's not a good idea, because sometimes you are in a tight deadline and other people expect to have the most stable idea/product but since there's a last minute changes, you don't have time to test the latest changes and the result is the decrement of the quality or even worse, it might make the product unusable again. That's why sometimes developers tends to have a freeze phase when they don't accept new changes or CR (change request) and only concentrating on PR (problem report) and bug fixings. This is the best time to run a full testing cycle and stabilizing the product before it will be released. Sometimes, last minute changes tends to make the schedule slips, just like what happened in some open source projects. They prefer to delay or postponed the release rather than delivering a buggy applications. Some people will get angry if they had to wait because they can't fulfill their promises, but i think it's better to wait for the final version which is more stable, secure, and robust. One of the case that i experienced is with Slackware Linux. Slackware 11.0 had some delays before the final version was released at the beginning of this month (FYI, this is the longest development time in Slackware's history). But the result was very very stable and robust. Slackware 11.0 is still considered one of the most stable and secured distro out of the box and Pat is trying to defend that title or even improving it. The conclusion: Sometimes, you have to dare to say NO when you are faced with last minute changes. Silently, the OOo team has released OOo 2.0.4, the next OpenOffice.org release which supports for a new firefox-extensions format that can be used to extends main functionality of OpenOffice.org itself. You won't see the URL for the 2.0.4 release for now, as they are still showing 2.0.3 version, but if you look at some mirrors (Kambing or Komo or GDS for instance), then you can see that they have provided the 2.0.4 release, so right now, OpenOffice.org has told the mirrors to sync their repository to get the latest one and until they have fully syncronized, the OOo team will not update the download page (but you do know where to find the latest version right??). I'm downloading it right now and it's almost finished. In some reviews that i saw said that the 2.0.4 version has an improvements on the time needed to startup and that's one of the biggest complaint from most users that uses OOo. We will see whether OOo development team has managed to reduced the startup time in this release. * Version 0.12.3 of Kopete replaces 0.11.3 in KDE 3.5.5, it includes support for Adium themes, performance improvements and better support for the Yahoo! and Jabber protocols. * Support for sudo in kdesu. * Support for input shape from XShape1.1 in KWin (KDE window manager). * Lots of speed improvements and fixes in Konqueror's HTML engine, KHTML. * CUPS 1.2 support in KDEPrint. * Big improvements in the number of translated interface elements in Chinese Traditional, Farsi, Khmer, Low Saxon and Slovak translations. Merge window for the next 2.6.19 kernel is already closed by Linus Torvalds by releasing RC1 few days ago. When i saw LWN's Kernel Development Page, i saw an interesting article about the efforts to increase boot time in Linux platform by changing the API driver core, so hopefully when the final version of 2.6.19 is released, we will have a faster system (but don't expect too much as it will still be marked experimental in 2.6.19 and probably will be finished and considered stable on 2.6.20). The Linux driver core subsystem continues to evolve at a high rate. The set of patches for 2.6.19 continues this process with a number of improvements - and a number of API changes. This time around, however, the changes appear to be additive, and thus should not break any existing drivers. Linux boot time is an ongoing sore point - there are few users who wish that their systems would take longer to come up. There are many things which happen during the boot process, and many possible ways of speeding things up. Most of the opportunities for improving boot time lie in user space, but, on the kernel side, probing for devices can take a lot of time. Each device must be located, initialized, and hooked into the system; this process can involve waiting for peripheral processors to boot, firmware loads, and, perhaps, even physical processes like spinning up disks. As a result, much of the kernel time spent bringing up devices is idle time, waiting for the device to do its part. One obvious idea for improving this process is to probe devices in parallel. That way, when the kernel is waiting for one device to respond, it can be setting up another; the kernel would also be able to make full use of multiprocessor systems. The 2.6.19 device core will, at last, have the ability to operate in this mode. The changes start by adding a flag (multithread_probe) to the device_driver structure. At probe time, if a driver has set that flag, the actual work of setting up the device will be pushed into a separate kernel thread which can run in parallel with all the others. At the end of the initialization process, the kernel waits for all outstanding probe threads to finish before mounting the root filesystem and starting up user space. On uniprocessor systems, this change leads to a relatively small reduction of bootstrap time. Drivers typically do not yield the processor during the probe process, so there is relatively little opportunity for parallelism, even during times when the kernel has to wait for a bit. On multiprocessor systems, however, the effect can be rather more pronounced - each CPU can be probing devices in parallel with all the others. So this change will be most useful on large systems with lots of attached devices. At least, it will be useful once it's enabled; this feature is currently marked "experimental" and carries a number of warnings. Even when it is turned on, it only applies to PCI devices. Not all drivers are written with parallel probing in mind, so they may not have the right sort of locking in place. There can be problems with power drain - turning on too many devices simultaneously can cause a high demand for power over a short period of time; if this demand exceeds what the power supply can deliver, the resulting conflagration could slow the boot process considerably. The order of device enumeration is likely to become less deterministic. And so on. Still, this feature, over time, should lead to faster system boots, especially on systems (such as embedded applications) where the mix of hardware is well understood and static. My limited account for Mandriva Linux 2007 has been obsolete and expired (they're only limited for a few days) and i cannot update them again, since Mandriva doesn't offer that kind of service again in the download section. They changed their way of distributing the Mandriva Linux 2007 PowerPack edition by using Mandriva Club account and no more http access. I have 2 Mandriva Club account and one of them will expire in the next 23 days, so if you want to download the Mandriva Linux 2007, you can send me an email and i'll give you the user/password, but please don't change the password, because it will be used by other people as well please consider to support Mandriva by buying it via Mandriva Store. I hope this answers some people who asked about the previous account information which is now can't be used anymore. UPDATE (29 Oct 2006): I'm no longer giving my Mandriva account information to other people. Sorry folks. The party is over and if you like to have PowerPack edition, please buy it from Mandriva Store. In my previous post, i have mentioned something about playing with serial ports and today i will continue to give small description about the problems i encountered. Hopefully somebody have the answer and can give the answer for me. Finally, after three days of downloading, Slackware 11.0 ISOs are completely downloaded and tonight i will burn the last ISO. Indonesian mirrors are limited, so i had to use other public mirrors and it's quite fast. Since i have been using -current, then i don't need to upgrade at all. The ISO is just like a baseline for me when i want to have a fresh new system, so i don't have to install/upgrade a lot of applications. DVDs can be downloaded only via FTP. We are proud to announce that Slackware Linux version 11.0 has been finally released; it took some time but is well worth the wait. You can read the official announcement at this link. This Slackware version is by far the most cutting edge ever released, it includes KDE version 3.5.4 (including the Amarok media player), XFCE 4.2.3.2, the latest versions of Firefox and Thunderbird, plus SeaMonkey 1.0.5 (replacing the Mozilla suite). It also includes glibc-2.3.6, gcc-3.4.6, X11R6.9.0 from X.Org, and more! Due to the overwhelming number of changes in this release, we have added a CHANGES_AND_HINTS.TXT file which contains information on the evolution of slackware-current. This should prove useful for users upgrading to slackware-11.0. To order your copy of Slackware Linux (available on CD-ROMs and DVD this time) or some other Slackware goodies visit our store. You'll be helping to support the continued efforts of the the Slackware Linux Project. As always, ISO images are available through BitTorrent but you can also download them from any official Slackware Mirror or from these other mirror sites. Thanks to everyone who helped to make this new release of Slackware possible, the mirror administrators, and to a fine group of friends on irc.oftc.net for their help with Slackware development, this site, and the BitTorrents! Last night, my cousin was going back to Australia after few days in Indonesia to finish some things that has to be done. He picked Garuda Indonesia for his flight from Australia to Indonesia and vice versa and it was his first time using Garuda. Usually, he tends to use Qantas Airways. His plane was scheduled to leave at 8.20 PM and we went from my auntie's house at 5.30 just to be safe because Jakarta was very very unpredictable for traffic jam problems. Luckily the road was very clear so it only took less than half an hour to get into the airport. I accompannied my cousins until the front gate because i couldn't came in and then he was processing his tickets and so on. After about thirty minutes or probably more, he came out and said that there was a problem with the ticket. When he used Qantas, he didn't have to bring the physical tickets, because it's already listed on Qantas' database, so you only need to confirm that the name on your passport matches with your record on the database and that's all. But it seems that Garuda is still using the manual procedures, so you have to bring your tickets and they will confirm it three times (tickets, database record, and also your passport). Because the real ticket was still in Bandung (because his girlfriend who bought the ticket wasn't leaving to Australia at that day, she still hold the ticket), so my cousin couldn't get into the plane and he had to buy another ticket for that. Luckily they will refund the money in Australia after he shows the original tickets (that means he has to wait until his girlfriend comes to Australia). What an unpleasant way to treat people who are leaving for other countries. He was very lucky as we didn't leave him before he finishes all his administration at the airport. That's a new lesson that i learn when we want to go abroad using local airways. Always bring all the documents needed (passport, visa, and also tickets). When you are using international airways, perhaps you will only need to bring passport and visa (and very small printed paper to replace the ticket). I think Garuda Indonesia (and all domestic airways) should learn about this also. When they have such a good technology infrastructure, they should learn to trust it and utilize it, rather than having to do the manual ways all over again. It's time and money wasting. Why do they have to build such a huge infrastructure if at the end they just don't use it? ?